In September the team attended an intensive workshop on the development and principles of recirculating aquaculture systems (RAS) led by IFREMER (France) and Wageningen University (The Netherlands) through the European AQUAEXCEL 2020 program at the IFREMER Sète research station. This course was a great success and an unique opportunity to strengthen the MOREFISH team’s overall knowledge on the very promising area of recirculating aquaculture systems (RAS) and their various applications for the rearing and culture of different species (e.g. salmon, rainbow trout) at different life stages (e.g. nursery, on-growing) and under different conditions (fresh/saline, cold/warm waters). The different presentations, given by some of the renowned researchers/practitioners in the field (J.P. Blancheton from Ifremer, P.B. Pedersen from DTU Aqua, E. Eding from Wageningen University and R.H. Piedrahita from the University of California among others) covered all the relevant topics including water treatment (nitrification, denitrification, dephosphatation, algae nutrient assimilation, solids removal), microbiology and the bacteria dynamic in such systems, gas control, energy control, integrated multi-trophic aquaculture (IMTA) and mass balances. • Becoming aware of the ongoing research to increase the efficiency and acceptability of RAS. 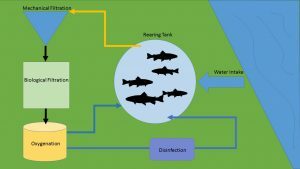 Furthermore, this course was of great benefit for the MOREFISH project because the application of such systems in Ireland will allow the sector to drastically reduce the impact of aquaculture activity on the environment and specifically on water quality (water is theoretically fully treated before reuse and there is theoretically no discharge water and therefore no pollution created by this discharge water) compared to the current situation where most of the facilities are operated as flow through systems. If RAS are developed in Ireland, it will therefore be possible to both increase the overall production and to reduce the impact of the Irish aquaculture industry. The overall sustainability of fish production will therefore be greatly increased by the application of such technologies in Ireland. All the networking initial objectives were also fulfilled with the building of a strong network over all the 30 participants (15 nationalities) represented during this week. The MOREFISH project have invited Per Bovbjerg Pedersen to be a guest speaker at the next Workshop on Freshwater Aquaculture “Increasing Irish production in a sustainable manner under emerging environmental constraints” in late January 2017.